ALL CUT THINWALL PVC PIPE IS NON-CANCELABLE and NON-RETURNABLE, so be sure you are ordering the size and type of pipe you want. 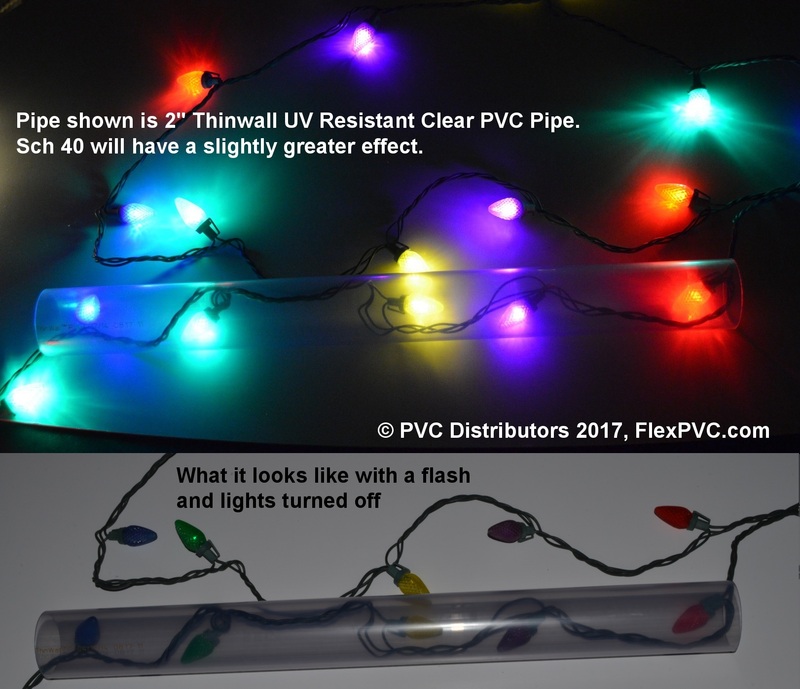 If you have questions about these UV-resistant PVC pipes, call or email before you order. All thinwall clear PVC pipes have a line of printing along one side. It's gold and hard to see, but it is there. All UV-resistant PVC pipes fit standard Sch 40/80 (plumbing and furniture grade fittings.) The differences are the certification (NSF vs Non-NSF, UV vs Non-UV) and wall thickness. The OD (outside diameter) remains consistent for all the thinwall clear PVC pipes. Also note: Orders with cut pipe add 1-2 days to processing time and are not returnable. However, if you select Next Day, 2nd day or 3 day shipping on the check out page AND you are shipping to the billing address for the credit card AND your order is placed by 10am, we will ship the same day (unless we are out of stock.) For all other orders, allow 1-3 extra days to ship your order. Click here for PVC-CLEAR-PIPE-NSF-Sch40 NSF 51/61. 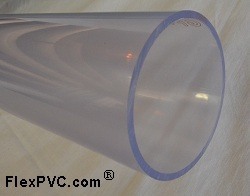 Click here for For UV Rated Sch 40 (but NOT NSF rated) Clear PVC pipe. You are here: UV Rated Thinwall PVC Pipe. This is what you want to use if you are exposing the pipe to Sun or High UV light. Will not darken or change color. Thinwall transmits light better and has less distortion if you are using it to see inside the pipe. Color is clear with a blue tint. 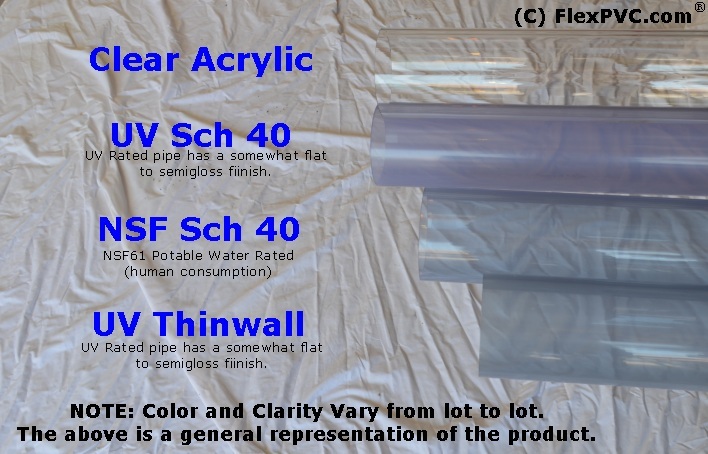 Click here for Sch 80 Clear PVC Pipe NSF rated for potable water by the foot.